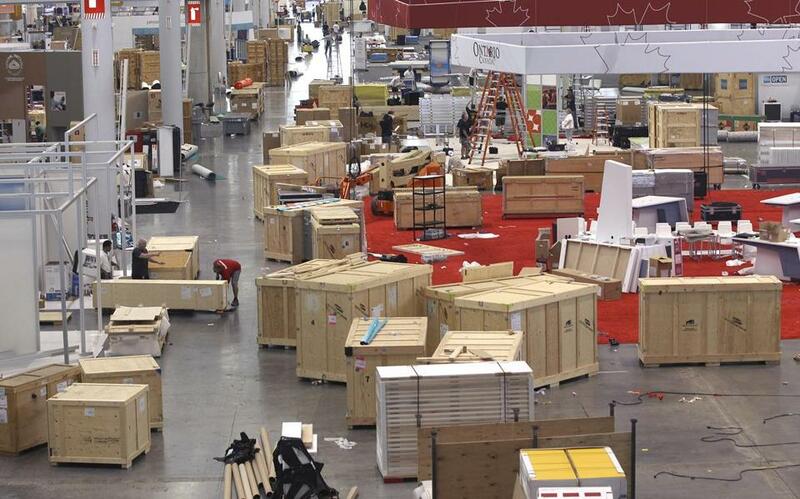 Backpacks, pens, and building materials are often left over from events at the Boston Convention & Exhibition Center. A half-hour after the Biotechnology Industry Organization convention wrapped up Thursday, while the taxi line out front was still long, local teamsters arrived to break down the elaborate pavilions that filled the cavernous Boston Convention & Exhibition Center this week. But many of the promotional leftovers from those displays — including boxes of pens, key chains, and backpacks — were not being shipped back to exhibitors in the United States and around the world, or even just tossed. The Massachusetts Convention Center Authority, which runs the South Boston facility, had something else in mind for the excess free stuff, known as “swag.” Under a two-year-old program it runs called Conventions CARE, or Community Assistance by Responsible Events, companies participating in convention hall events can place their unwanted promotional items in blue bins on the exhibition hall floor. The contents are then sorted and donated to local nonprofit organizations. To date, Conventions CARE has resulted in the donation of 243,000 pounds of goods to area charities, according to the convention center authority. Last year, after the Orgill Fall Dealer Market, a hardware dealers’ showcase, the program worked to negotiate a deal with Boston Habitat for Humanity under which the nonprofit home-building organization drove off with 12 tractor-trailer loads of hammers, nails, power equipment, home fixtures, and garden supplies weighing 96,000 pounds. The goods went to its ReStore retail outlet in West Roxbury, where they are still being sold. Proceeds are used to fund construction of Habitat homes. 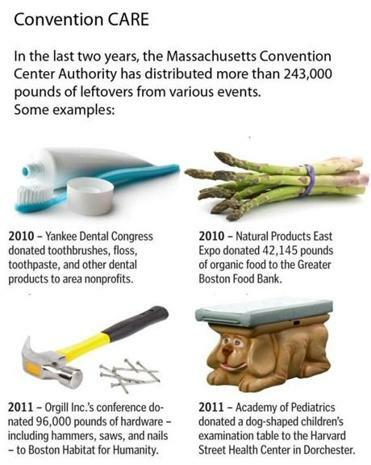 Two years ago, after the Natural Products East Expo, the convention donated more than 42,000 pounds of organic food to the Greater Boston Food Bank. James E. Rooney, executive director of the Massachusetts Convention Center Authority, said Conventions CARE has an impact on several fronts, in addition to helping nonprofits. “We give our events a chance to have an even greater impact in Boston, it saves our customers time and money, and we keep all this material out of the waste stream and put it to good use,” he said. Some of the postconvention donations are, well, less conventional than others. For instance, a dog-shaped pediatric examination table from an American Academy of Pediatrics gathering ended up at the Harvard Street Neighborhood Health Center in Dorchester. And not everything gets redistributed — most companies and organizations strive to closely estimate how many freebies they will need to hand out. 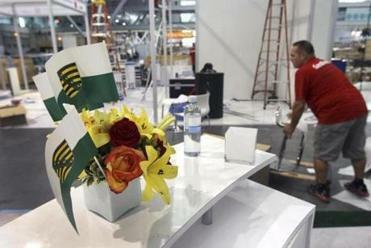 Flowers are left when conventions end, but T-shirts and pens are given to local nonprofits. At this year’s Biotechnology Industry Organization convention, the Hong Kong pavilion gave away fortune cookies to visitors. When the event closed Thursday, two big boxes remained — an improvement over past shows, according to Lawrence Chiu, a representative at the pavilion. “Last year, I brought about 10 boxes, and even after I tried to give as many away as I could, I think I still ended up shipping four boxes home,” Chiu said. This year, he is bringing the cookies back with him to Los Angeles. “My sister’s a teacher, so I’ll give them to her for her students,” he said. Unfortunately, it is often hard to find new uses for many of the materials used to create the displays, according to Mac Daniel, convention center authority spokesman, although some of it is recycled. On Thursday afternoon, Eunnee Kwon, the developer of Korean biopharmaceutical company Celltrion’s elaborate display that featured a round LED message board, plasma televisions, and curved, modern walls and displays, stood watching workers deconstruct the area, tossing the composite walls aside. “I’m looking for a place to recycle this, but I haven’t found that yet,” he said. Gail Waterhouse can be reached at gail.waterhouse@globe.com.